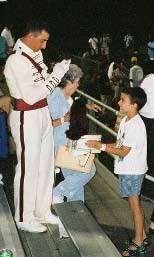 "This is a picture of the Cadets' drum major giving an autograph to a child at the Faquier (Warrenton, Va.) show July 20, 2004. I don't know the drum major but I think he might like it. The show was awesome." Thanks!